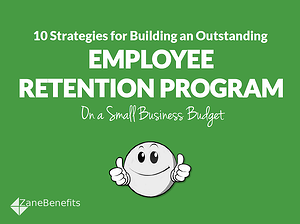 Zane Benefits, the leader in individual health insurance reimbursement for small businesses, announced today the publication of a new eBook, "10 Strategies for Building an Outstanding Employee Retention Program on a Small Business Budget." The guide provides ten practical strategies for retaining the best employees. According to Zane Benefits, most businesses, even the smallest ones, have a strategy for recruiting and hiring employees. But once a key employee is on board, how do you keep him or her from jumping ship? For a small business, the loss of one key employee can be devastating; it can mean the difference between accomplishing a key business goal, or falling short. That's where an employee retention program can help. The new guide helps small business owners and HR professionals build an outstanding employee retention program to retain the best employees.